ALZHEIMER'S DISEASE AND POLYPHENOLS, A THERAPEUTIC POTENTIAL? Herein, we discuss the neurobiological and neuroinflammatory pathways of AD, evaluate different molecular targets and the therapeutical potential effect of polyphenols, with an emphasis on curcumin, for the treatment of AD. Alzheimer’s disease (AD) in one of the progressive degenerative diseases of the central nervous system (CNS) and is the most common cause of dementia in the elderly population. -formation of intraneuronal tangle owing to hyperphosphorylation of axonal Tau protein. Although deposition of Aβ peptide mediated neuronal damage is one of the major hallmarks of AD, the exact sequence of neuronal loss, synaptic dysfunction oxidative stress and biochemical cascade of events therein are still unknown. Figure 1: Querfurth, H. W. & LaFerla, N. Engl. J. Med. 362, 329–44 (2010). Amyloid-β-peptide is formed by the secretase-mediated cleavage of APP. β -secretase cleaves APP at the N-terminus, generating an extracellular soluble fragment (sAPP) and leaving an intramembrane fragment called C99. Aβ also forms reactive oxygen species which can further enhance the formation of Aβ and cause neuronal damage via lipid peroxidation, DNA damage and protein oxidation. The recognition that the neurotoxicity of β-amyloid is associated with the generation of reactive oxygen species in the brain has led to active research in the efficacy of antioxidant therapies. Neurodegenerative diseases such as AD are a major contributor to the chronic disease burden in old age. Dementia is a significant cause of death and disability in acculturated societies and AD accounts for a large proportion of cases of dementia in the elderly. AD is a form of dementia with symptoms including cognitive impairment and memory loss caused mainly by the loss of cholinergic neurons in the limbic system, neocortex and hippocampus. New therapies based on the pathogenic processes underlying AD are urgently needed, especially given the recent limitations of such novel and directed treatments. Alzheimer’s disease. N. Engl. J. Med. 362, 329–44 (2010). Figure 2: Querfurth, H. W. & LaFerla, N. Engl. J. Med. 362, 329–44 (2010). Polyphenols are a structural class of mainly natural, but also synthetic or semisynthetic, organic chemicals characterized by the presence of large multiples of phenol structural units. The word phenol refers to a chemical structure formed by attaching to an aromatic benzenoid (phenyl) ring, an hydroxyl (-OH) group akin to that found in alcohols (hence the "-ol" suffix). The number and characteristics of these phenol structures underlie the unique physical, chemical, and biological (metabolic, toxic, therapeutic, etc.) properties of particular members of the class. They may be broadly classified as phenolic acids, flavonoids and non-flavonoid. Phenolic acids are non-flavonoid polyphenolic compounds which can be further divided into two main types, benzoic acid and cinnamic acid derivatives based on C1–C6 and C3–C6 backbones. While fruits and vegetables contain many free phenolic acids, in grains and seeds—particularly in the bran or hull—phenolic acids are often in the bound form. anthocyanins, flavan-3-ols, flavones, flavanones and flavonols. Figure 3: Ramassamy, CEur. J. Pharmacol. 545, 51–64 (2006). In addition to the phenolic acids and flavonoids, there are several non-flavonoid, polyphenols found in foods that are considered important to human health. Among these, resveratrol is unique to the grapes and red wine; and curcumin is a strong antioxidant from turmeric. Synthetic polyphenols are commonly used as pH indicators in cell culture media and synthetic food additives. Generally foods contain complex mixtures of polyphenols. The most important food sources are commodities widely consumed in large quantities such as fruit and vegetables, green tea, black tea, red wine, coffee, chocolate, olives, and extra virgin olive oil. Herbs and spices, nuts and algae are also potentially significant for supplying certain polyphenols. Some polyphenols are specific to particular food (flavanones in citrus fruit, isoflavones in soya, phloridzin in apples); whereas others, such as quercetin, are found in all plant products such as fruit, vegetables, cereals, leguminous plants, tea, and wine. 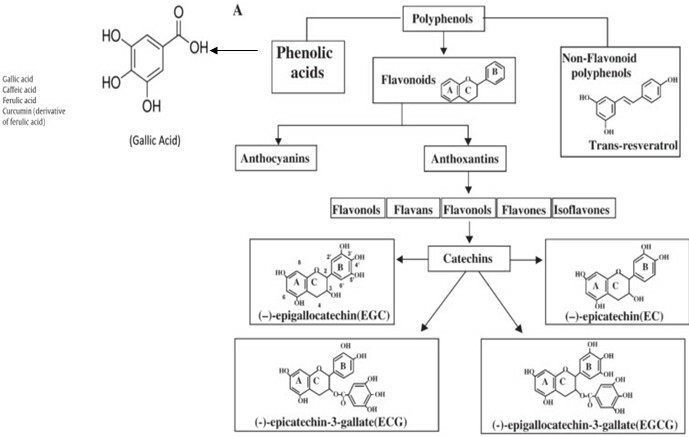 Bioavailability of the polyphenols: status and controversies. Int. J. Mol. Sci. 11, 1321–42 (2010). Dietary polyphenols have received tremendous attention among nutritionists, food scientists and consumers due to their roles in human health. Research in recent years strongly supports a role for polyphenols in the prevention of degenerative diseases, particularly cancers, cardiovascular diseases and neurodegenerative diseases. Polyphenols are strong antioxidants that complement and add to the functions of antioxidant vitamins and enzymes as a defense against oxidative stress caused by excess reactive oxygen species (ROS).. Modulation of cell signaling pathways by polyphenols may help significantly to explain the mechanisms of the actions of polyphenol-rich diets. In the meantime, chemically, polyphenols are a group of natural compounds with phenolic structural features. Emerging role of polyphenolic compounds in the treatment of neurodegenerative diseases: a review of their intracellular targets. Eur. J. Pharmacol. 545, 51–64 (2006). Polyphenols are secondary metabolites that plants produce to protect themselves from other organisms. High intake of fruits, vegetables and whole grains, which are rich in polyphenols, has been linked to lowered risks of many chronic diseases including cancer, cardiovascular disease, chronic inflammation and many degenerative diseases, such as Alzheimer’s disease: many of these diseases are related to oxidative stress from reactive oxygen and nitrogen species. Phytochemicals, especially polyphenols, are the predominant contributor to the total antioxidant activities of fruits, rather than vitamin C.
Polyphenols have been found to be strong antioxidants that can neutralize free radicals by donating an electron or hydrogen atom. The highly conjugated system and certain hydroxylation patterns such as the 3-hydroxy group in flavonols are considered important in the antioxidant activities. Polyphenols suppress the generation of free radicals, thus reducing the rate of oxidation by inhibiting the formation or deactivating the active species and precursors of free radicals. More frequently, they act as direct radical scavengers of the lipid peroxidation chain reactions (chain breakers). Chain-breakers donate an electron to the free radical, neutralizing the radicals and themselves becoming stable (less reactive) radicals, thus stopping the chain reactions. In addition to radical scavenging, polyphenols are also known as metal chelators. Chelation of transition metals such as Fe2+ can directly reduce the rate of Fenton reaction, thus preventing oxidation caused by highly reactive hydroxyl radicals. Polyphenols do not act alone. It has been found that polyphenols can actually function as a co-antioxidant, and are involved in the regeneration of essential vitamins. In addition to the above possible mode of antioxidant actions, other mechanisms such as inhibition of xanthine oxidase and elevation of endogenous antioxidants are also considered important . Polyphenols can induce antioxidant enzymes such as glutathione peroxidase, catalase and superoxide dismutase that decompose hydroperoxides, hydrogen peroxide and superoxide anions, respectively, and inhibit the expression of enzymes such as xanthine oxidase. Chemistry and biochemistry of dietary polyphenols. Nutrients 2, 1231–46 (2010). The Aβ deposited in AD is derived from the larger amyloid precursor protein (APP). Surface APP can be endocytosed, and then undergo various forms of processing, one of which results in the formation of Aβ peptides. These peptides have the ability to aggregate and generate the amyloid that is found in the AD brain. -A number of them, including curcumin and quercetin, were shown to dose-dependently inhibit the formation of Aβ fibrils as well as elongation. -Polyphenols can bind directly to Aβ or mature aggregates and impair their stability, as all the compounds tested destabilised preformed Aβ fibrils. 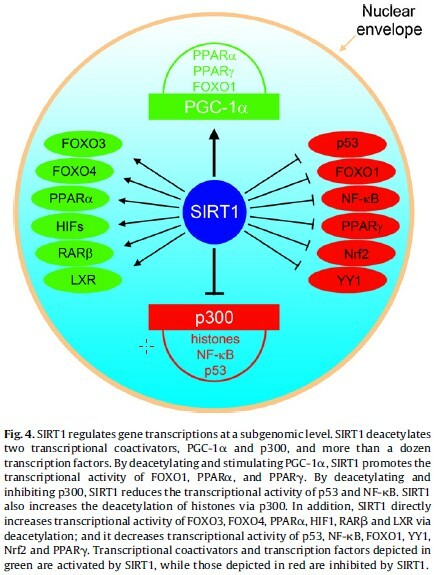 Sirtuins are a class of proteins involved in longevity and cell survival. They possess deacetylase or monoribosyltransferase activity and play critical roles in cell survival in response to oxidative stress and caloric restriction regimes. In mammals, seven sirtuins (SIRT1-7) have been identified. They have different specific substrates including histones, transcriptional regulators and enzymes. They also have various biological functions, are localised in specific cell compartments and play various roles in health and disease including ageing and neurodegeneration. 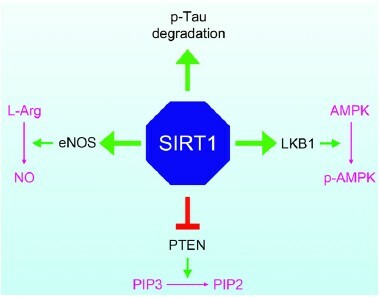 Protective effects and mechanisms of sirtuins in the nervous system. Prog. Neurobiol. 95, 373–95 (2011). Figures 4 and 5: Zhang, F. et al. Prog. Neurobiol. 95, 373–95 (2011). Therefore, it seems likely that some polyphenols, as resveratrol can effectively suppress both p53 and FOXOs and can confer neuronal protection in AD brain. Curcumin is a bright yellow powder that was first identified in 1910. This substance was isolated from the plant Curcuma longa or turmeric that is commonly used for culinary purpose. Turmeric, Curcuma longa L. (Zingiberaceae family) rhizomes, has been widely used for centuries in indigenous medicine for the treatment of a variety of inflammatory conditions and other diseases. Its medicinal properties have been attributed mainly to the curcuminoids and the main component present in the rhizome includes curcumin (diferuloylmethane)—(1,7-bis (4-hydroxy- 3-methoxyphenyl)-1,6-hepadiene-3,5-dione). In the image are showed the principal activities demostrated in in vitro and in vivo studies. 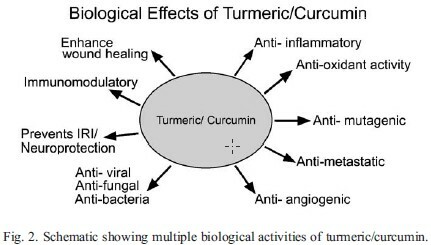 Multiple biological activities of curcumin: a short review. Life Sci. 78, 2081–7 (2006). Figure 6: Radha K. Maheshwari et al. Life Sci. 78, 2081–7 (2006). Figure 7:Hamaguchi, T., Ono, K. & Yamada. Ther. 16, 285–97 (2010). The early evidence of a protective role of curcumin in AD derived from epidemiological studies. Ganguli and colleagues demonstrated that Indian population, who has a curcumin-enriched diet, has a reduced prevalence of AD compared to United States. Following this initial observation, several preclinical studies showed the therapeutic potential of curcumin in the pathophysiology of AD. Incidence of Alzheimer’s disease in a rural community in India: The Indo-US Study. Neurology 57, 985–989 (2001). -improvement in the behavioural impairment. Figure 8: Ray, B. & Lahiri, D. K. Curr. Opin. Pharmacol. 9, 434–44 (2009). Natural substances and Alzheimer’s disease: from preclinical studies to evidence based medicine. Biochim. Biophys. Acta 1822, 616–24 (2012). Neuroinflammation in Alzheimer’s disease: different molecular targets and potential therapeutic agents including curcumin. Curr. Opin. Pharmacol. 9, 434–44 (2009). As the human population continues to age, interventions that improve the quality of life and delay the onset of age-related diseases are highly desirable. Polyphenols are candidates for such interventions through their diverse biochemical roles including free radical scavenging, protein homeostasis, metal chelation, telomere maintenance and stimulation of sirtuins. Their potent effects in combination with little or not known toxicity may give them a therapeutic advantage. Some placebo-controlled clinical trials concerning the effects of curcumin on AD have been conducted: no significant differences in cognitive function or in plasma or CSF biomarkers were observed between placebo and curcumin groups, and no adverse events were reported. In these studies there is substantial in-vitro data indicating that curcumin has an antioxidant, anti-inflammatory, and anti-amyloid activity. In addition, studies in animal models of AD indicate a direct effect of curcumin in decreasing the amyloid pathology of AD. As the widespread use of curcumin as a food additive and relatively small short-term studies in humans suggest safety, curcumin is a promising agent in the treatment and/or prevention of AD. Nonetheless, important information regarding curcumin bioavailability, safety and tolerability, particularly in an elderly population is lacking. 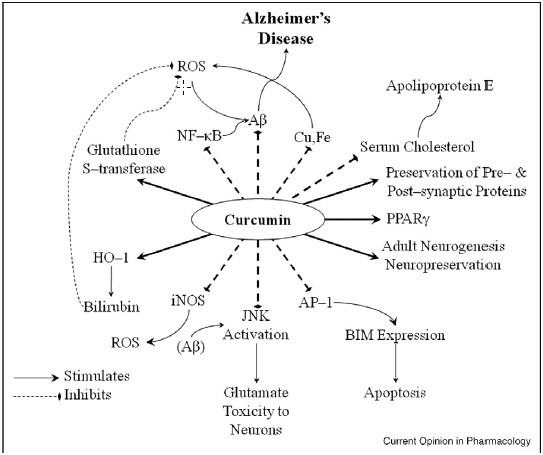 REVIEW: Curcumin and Alzheimer’s disease. CNS Neurosci. Ther. 16, 285–97 (2010). Six-Month Randomized, Placebo-Controlled, Double-Blind, Pilot Clinical Trial of Curcumin in Patients With Alzheimer Disease. Journal of Clinical Psychopharmacology:February 2008 - Volume 28 - Issue 1 - pp 110-113. A Potential Role of the Curry Spice Curcumin in Alzheimer’s Disease. 2, 131–136 (2006). Interesting is a Recent study which have revealed astrocytes (AS) as being key factors in the early pathophysiological changes in AD. Glial fibrillary acidic protein (GFAP), a marker specific to AS, is markedly more manifest during morphological modifications and neural degeneration signature during the onset of AD. Several studies investigating the functionality of curcumin have shown that it not only inhibits amyloid sedimentation but also accelerates the disaggregation of amyloid plaque. The intent of the study is to find the relationship between curcumin and spatial memory in AD, to investigate the effects of curcumin in amyloid-β (Aβ1-40) induced AD rat models on both the behavioral and molecular levels, that is to say, on their spatial memory and on the expression of GFAP in their hippocampi.Results were statistically significant, showing that the spatial memory of AD rats improved following curcumin treatment (p < 0.05), and that the expression of GFAP mRNA and the number of GFAP positive cells in the curcumin treated rats was decreased relative to the AD group rats (p < 0.05). Furthermore, the expression level of GFAP mRNA in hippocampal AS in the AD rats significantly increased when compared with that in the sham control (p < 0.05). Taken together, these results suggest that curcumin improves the spatial memory disorders (such disorders being symptomatic of AD) in Aβ1-40-induced rats by down regulating GFAP expression and suppressing AS activity. slowed an imminent decline and failed to target the root cause of AD. Amyloid-like deposits result from aggregation of the Ab peptide, and thus, reducing amyloid burden by preventing Ab aggregation represents an attractive approach to improve the therapeutic arsenal for AD. Recent studies have shown that the natural product curcumin is capable of crossing the blood-brain barrier in the CNS in sufficient quantities so as to reduce amyloid plaque burden. Based upon this bioactivity, is hypothesized that curcumin presents molecular features that make it an excellent lead compound for the development of more effective inhibitors of Ab aggregation. To explore this hypothesis, some studies have screened a library of curcumin analogs and identified structural features that contribute to the anti-oligomerization activity of curcumin and its analogs. 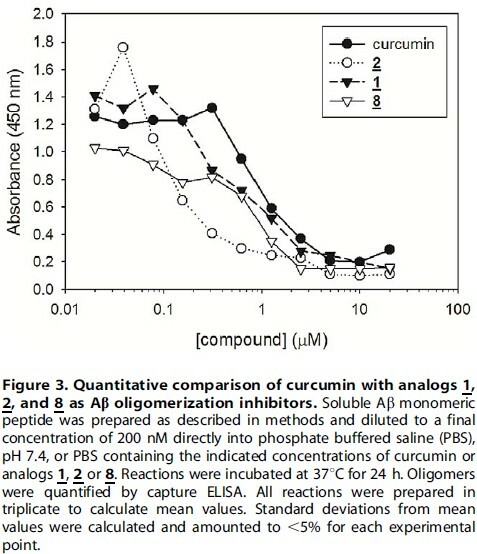 Investigators have begun to address this hypothesis by introducing modifications into the basic structure of curcumin and examining the effect of these changes on Ab aggregation, neuroinflammation and Ab-induced neurotoxicity, Although these findings clearly show that thebase structure of curcumin can be modified without compromising certain properties of its bioactivity, none of the compounds tested show significant improvement as Ab aggregation inhibitors when compared to native curcumin. Figure 9: Robert A. Orlando et al. PLoS One 7, e31869 (2012). The goal of these studies was to identify and develop more effective aggregation inhibitors by capitalizing on the newly established inhibitory properties of curcumin. 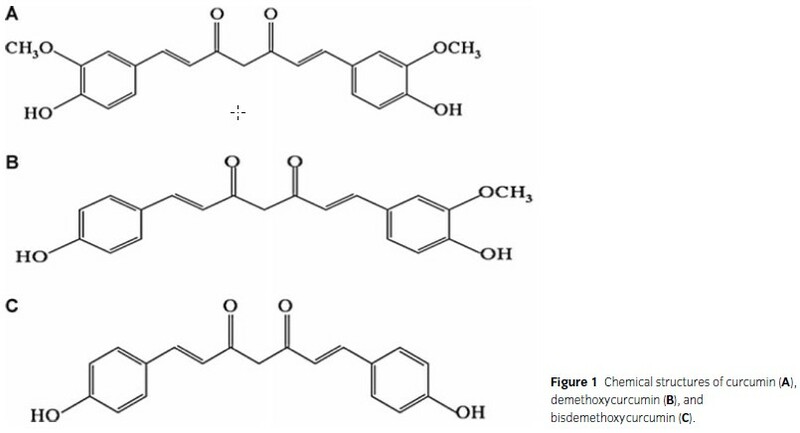 In order to achieve this goal, it was hypothesized that the base structure of native curcumin provides an excellent starting point to identify chemical analogs that have greater efficacy in reducing or preventing Ab peptide oligomer formation, while improving upon the generally poor bioavailability of curcumin. A chemical analog of curcumin as an improved inhibitor of amyloid Aβ oligomerization. PLoS One 7, e31869 (2012). concentrations in the 10 nM range and in urine after oral dosing between 0.45 g and 3.6 g daily for up to 4 months. In addition to the poor bioavailability mentioned above, curcumin metabolites that are the result of either conjugation or reduction have been found to be biologically inactive. Therefore, it remains unclear how curcumin exerts diverse pharmacological effects. There are however, various strategies currently under investigation to improve bioactivity, as the use of nanoparticle carriers coupled to polyphenols. The pharmacology of curcumin: is it the degradation products? Trends Mol. Med. 18, 138–44 (2012). Another therapeutical approach studied is finalized to improve the innate immune system of AD patients, stimulating macrophages by 1α,25(OH)2-vitamin D3 in combination with curcuminoids. AD patients’ macrophages segregate into Type I (positively stimulated by curcuminoids regarding MGAT-III transcription) and Type II (not stimulated). In both Type I and Type II macrophages, 1,25D3 strongly stimulated Aβ phagocytosis and clearance while protecting against apoptosis. Certain synthetic curcuminoids in combination with 1,25D3 had additive effects on phagocytosis in Type I but not Type II macrophages. Human macrophages are a new paradigm for testing immune therapies for AD. 1alpha,25-dihydroxyvitamin D3 interacts with curcuminoids to stimulate amyloid-β clearance by macrophages of Alzheimer’s disease patients. J. Alzheimers. Dis. 17, 703–17 (2009). 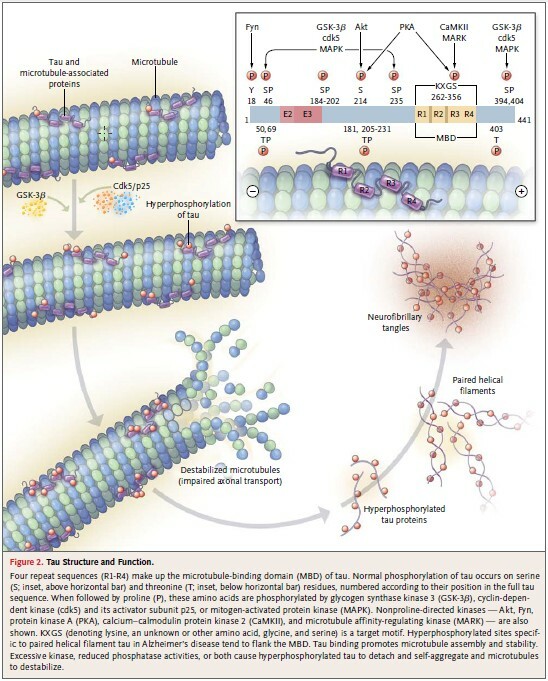 In summary, the bulk of recently published data illustrated the emerging and promising role of polyphenolic compounds as therapeutic tools in neurodegenerative disease such as Alzheimer disease. The emerging view is that polyphenolic compounds could exert beneficial effects on cells not only through their antioxidant potential but also through the modulation of different pathways such as signalling cascades, anti-apoptotic processes or the synthesis/degradation of the amyloid β-peptide. Unfortunately, none of clinical trials showed a dramatic improvement in the symptoms. Low absorption of curcumin through oral route may be a cause for that. A carrier mediated transport or nanotechnology based delivery system can increase the bioavailability of curcumin that will potentiate its effect, and these are the areas going to bear enormous importance in future research. Additional analyses using data from a larger number of patients and that obtained after a long duration of treatment are needed.